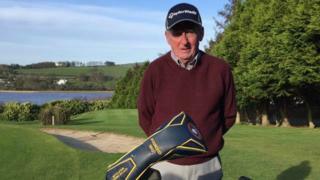 A Londonderry golfer has scored the second hole-in-one of his playing career - at the age of 87. Bert Whoriskey holed a seven iron at the 15th hole at City of Derry golf club. The octogenarian defied odds of more than 12,500 to one to score his hole-in-one. It is the second time he has bagged an ace at the course. Bert, a City of Derry member for more than 40 years, said his latest on course feat was "very exciting". "The people I were playing with say it didn't even hit the green, it just went straight in. "But to be honest, with a hole-in-one you have got to be a wee bit lucky." Bert, City of Derry's oldest member, plays "five days a week, every week, weather permitting". He said he hoped his latest ace will not be his last. "One of my regular playing partners has hit 11, I've only had two. "But I think I have a year or two left to get another one or two," he said. Bert marked his latest feat in time honoured golfing tradition buying a round of drinks for his playing partners at the 19th hole.